A.k.a. Honor Thy Father and Oro. (SPOT.ph) The Metro Manila Film Festival has always been making headlines. Sometimes it's about record-breaking sales, sometimes it's about favoring blockbusters over indie films, and other times, it's about the film entries themselves. 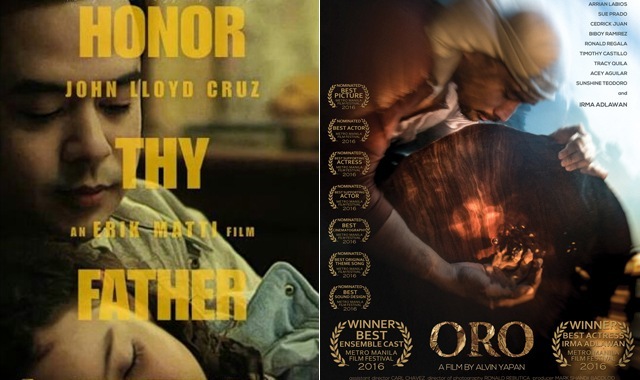 Two of these controversial films, of course, are Erik Matti's Honor Thy Father and Alvin Yapan's Oro—and if you want to see what the fuss is all about, they're both screening at Black Maria Cinema from April 1 to 5 for P200 each. Honor Thy Father was already controversial given that it revolves around a cult-like religion and its hyprocritical followers. But it also caused quite the stir in 2015 when the committee suddenly announced that the film was disqualified from competing at the festival. They argued that the people behind the film allegedly failed to disclose that Honor Thy Father had already screened at the Cinema One Originals film festival. The whole issue was even brought to Congress, where lawmakers questioned the due process of the disqualification. Even the movie's star, John Lloyd Cruz, appealed for change in the proceedings of the Metro Manila Film Festival (MMFF). Meanwhile, Oro is based on the real-life story of four miners who were killed in Camarines Sur by an environmental group formed by a former governor. The movie received the Fernando Poe Jr. Memorial Award, but it was recalled after Grace Poe condemned a scene where a dog was allegedly killed. Director Alvin Yapan denied the allegations saying they used a pig that was edited to look like a dog. But cast member Japo Parcero says two dogs actually died while filming—one accidentally, the other deliberately. Though both Oro and the Philippine Animal Welfare Society came to an agreement, the latter eventually demanded that the film be pulled out from cinemas and have its awards revoked.